NABARD Recruitment 2018 Development Assistant 62 posts. Applications are invited from eligible Indian citizens for the post of Development Assistant in NABARD. 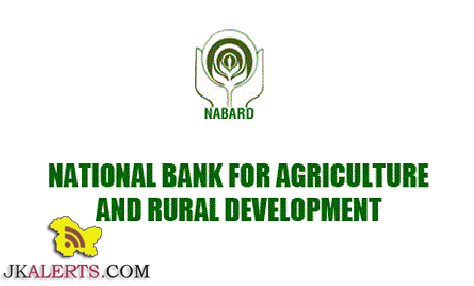 NATIONAL BANK FOR AGRICULTURE AND RURAL DEVELOPMENT NABARD invites applications for engagement of Development Assistant. All the interested candidates can apply for the various vacant positions in the NABARD. The NABARD published vacancies for jobs aspirants of J&K. Interested Candidates must possess Post Graduate or any higher/ equivalent qualification pass from an institute recognized by the Government to apply for the same post. All the Interested candidates may apply online on or before 15th Sept. 2018. 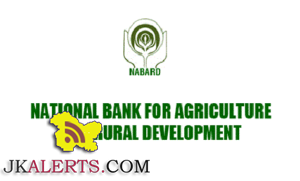 Jkalerts will provide you the complete detail about this NABARD Bank job notification like Eligibility criteria, How to apply Online, Important dates, Age limit with relaxation, post by category, Selection process & official notification. So interested candidates are requested to read it carefully to apply for Development Assistant Jobs in NABARD Jammu and Kashmir. Pay Band: Rs.14,650 + Other Benefits with Salary per Month. Education: Candidates who have passed in the Graduation in any stream with 50% marks are only eligible. Age Bond: Applicants age must be in between 18 years to 35 years. Those who lies in between this Minimum and Maximum age criteria. 27th Aug. 2018 is the Opening Date to apply. 15th Sept. 2018 is the Last date to apply. For NABARD Bank Upcoming jobs notifications Selection Lists and Results update Free Job Alerts and Updates for both Fresher and Experienced Candidates. Keep Visiting Jkalerts.